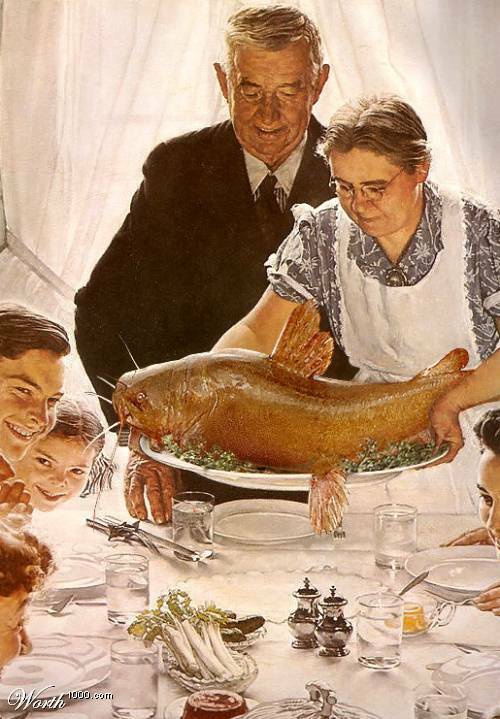 When it comes to your holiday dinner(s), it doesn't have to be Norman Rockwell. To the opposite extreme, you don't have to serve catfish (unless you really, really want to, and everyone is okay with that). It's a matter of finding a comfortable balance that doesn't leave you exhausted on the day after Christmas. Along those lines, it's important to be organized. In their excellent book, Simplify the Holidays, Allana Baroni and Vicki Webster have developed a timetable to make the classic holiday dinner a lot easier on you, who has to prepare it. The following is a dinner consisting of roast turkey, stuffing, gravy, mashed potatoes, a vegetable casserole, a salad, dinner rolls, followed by pie and whipped cream. You may adjust it according to your specific menu, and desired timetable - it's meant to be a general guide, only. Note: If you're looking for simpler alternatives to the traditional Christmas dinner, see the post immediately following this one. One month out (now): Plan your menu; make your shopping list; take an inventory of china, silver, glassware, and serving pieces. Two weeks prior: Buy nonperishable food: flour, spices, canned pumpkin, frozen turkey and vegetables. Buy non-perishable beverages such as wine, liquor, and mixers. One week prior: Wash any serving pieces, glassware, silverware, carving knives, pitchers or plates that you haven't used lately. Three days prior: Buy perishable foods such as potatoes, vegetables for the casserole and salad, and any staples such as eggs and milk. Begin thawing turkey in the refrigerator. Two days prior: Buy fresh turkey (if not using frozen) and refrigerate; shop for supplies such as ice, rolls, and fresh herbs. One day prior: Make pies; clean house. Six to eight hours before serving: Set table. Make hors d'oeuvres and refrigerate. 1-1/2 hours before: Put giblets on to cook, if you're planning on having giblet gravy. Prepare stuffing and put it in the oven; peel and chop potatoes and put them on the stove to cook. One hour before: Arrange hors d'oeuvres on platters and set them out for guests. Remove vegetable casserole from the refrigerator. 30 minutes before: Check thermometer to see how quickly turkey is cooking; transfer stuffing to serving dish and keep warm; mash potatoes, cover, and keep warm. 20 minutes before: Remove turkey from oven and let stand; baste with pan juices. Leave oven to warm rolls and heat vegetable casserole. Put away appetizers. 10 minutes before: Remove rolls from oven; cover and keep warm; uncork red wine if you're serving it; fill water glasses; set out butter; toss salad with dressing. Make gravy. After everyone has finished eating: Clear away plates and serving dishes; get them into a sink of sudsy water to soak - don't let food crust on them. You can put them in the dishwasher later. Set out dessert plates; make coffee/tea/other beverages; whip cream and offer dessert. *Adjust the cooking times according to individual recipes and the size of the bird. Depending on your oven temperature, the turkey may take slightly more or less time to cook; start checking it at least a half hour before you expect it to be done.